Girvan Dempsey is hopeful of no more outgoings, and only new arrivals at the province. Dempsey speaking to the media yesterday. LEINSTER’S MANAGEMENT HAS already turned one eye to next season with the province currently in the process of identifying potential targets to bring to the RDS. Speaking at yesterday’s weekly media briefing in UCD, backs coach Girvan Dempsey admitted they were looking at a number of players with a view to strengthening their panel for the 2016/17 campaign. Leinster have already confirmed the departure of Ben Te’o and Marty Moore, both of whom are moving to the English Premiership at the end of the season, as well as Ian Madigan, and the focus is now on bolstering their ranks to challenge on all fronts again. “There are a couple of guys we’re looking at but they’re all ongoing and we’re not in a position to divulge any information at this time,” Dempsey said when asked about any potential arrivals. While Dempsey admitted the province are looking elsewhere for reinforcements, there is also an emphasis on keeping hold of what they have. Nacewa and Cian Healy are two players who are out of contract at the end of the current season and talks are ongoing with the pair over extending their stay at the eastern province. “Pretty much working through that,” Dempsey continued. “It is a very busy time and we’re just trying to make sure we have all the right players contracted that we want to retain and looking elsewhere and see if there are players who can augment and improve our squad. “You want to retain all players. You want a full strength squad to be able to compete at both Pro12 and European level and it shows with our squad, we do get a lot of guys away on international duty and that’s fantastic, it’s something we’re always striving to do get those guys to that level. 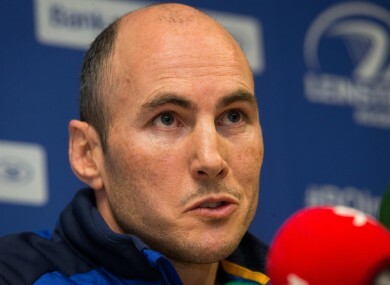 Email “Leinster 'looking at a couple of guys' with a view to strengthening ahead of next season ”. Feedback on “Leinster 'looking at a couple of guys' with a view to strengthening ahead of next season ”.